After Perera's heroics in the series opener, upbeat Sri Lanka seek maiden series win in South Africa. The enthralling Sri Lanka show in the opening Test has certainly ignited a new charm in the series. 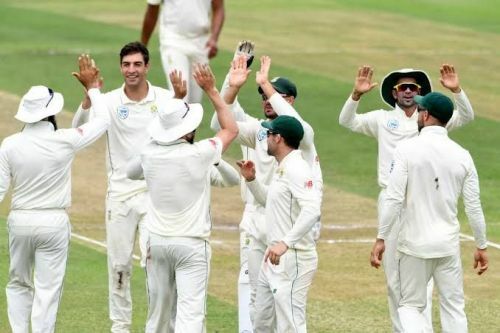 Now, pre-series favourites South Africa will aim to counter the visitors in the second and final Test at the St George's Park in Port Elizabeth from Thursday, February 21. The Islanders defied all odds to secure a stunning one-wicket win over the Proteas. Despite the win, the chinks in their batting were mostly visible, and the visitors would love to rectify them, with an aim to replicate their 2018 home show against same opponents and register their first ever Test series win in the African continent. Kusal Perera scored 204 runs in the opening fixture, with 51 runs in the first innings followed by an unbeaten 153 in the second to steer his side past the victory line. Dhananjaya de Silva and skipper Dimuth Karunaratne also struck 71 and 50 runs in the match. These players will be eager to put a good score on the board when they come out to bat in the next game. Skipper's major concern will be Niroshan Dickwella (0,8) and Kusal Mendis (12,0), both of whom failed to make a mark during the first Test. They will need them to score a decent one in the next game if Sri Lanka are to trouble the Proteas. Lasith Embuldeniya picked a five-wicket haul in last game. But Vishwa Fernando was the most impressive of the lot, claiming a four-fer in both innings. Both these young men will be eager to replicate that performance. Kasun Ranjit too was impressive, snaring four wickets in the first Test. He is another bowler in this line-up to watch out for. Dimuth Karunaratne (c), Lahiru Thirimanne, Oshada Fernando, Niroshan Dickwella (W), Dhananjaya de Silva, Suranga Lakmal, Lasith Embuldeniya, Kusal Perera, Kusal Mendis, Kasun Rajitha and Vishwa Fernando. South Africa seek revenge in the second test. Despite the loss in the opening Test, the Proteas won't be very concerned as there were enough positives for them to carry in the next Test. They had comprehensively beaten the visitors by 206 runs in their previous clash at this venue, which gives them an edge ahead of the match. Quinton de Kock and skipper Faf du Plessis were the standout performers for the Proteas with 135 and 125 runs respectively and these two have been the strength of their lineup. They will be expected to post a similar show in next outing. Apart from the two, Temba Bavuma was the only player to score 50 runs in the previous fixture and he will be expected to covert them into triple digits next time. The skipper will need a more positive intent from their openers as well as they failed to lay a platform in the earlier clash. Kagiso Rabada, Dale Steyn and Keshav Maharaj will be key to South Africa mounting a comeback in the second Test. Steyn was the pick of the bowlers with six wickets, while Maharaj and Rabada shared six wickets between them. In the absence of Philander, who has been ruled out due to injury, they should level up their performance and make early inroads into the Sri Lankan batting lineup. Faf du Plessis (C), Quinton de Kock (W), Wiaan Mulder, Keshav Maharaj, Kagiso Rabada, Dale Steyn, Duanne Olivier, Aiden Markram, Dean Elgar, Hashim Amla and Temba Bavuma.